A hand-made item is always special - you have put time and effort into a gift rather than just buying something. It is a gift filled with love! For presents from children handprints or fingerprints can be used effectively for a variety of occasions or just get your little one to go wild with a paintbrush! There are ways and means of ensuring they look beautiful, even with the smallest of child, and often the "less managed" items are the most effective. Maybe you are looking for a thank you gift for a teacher or child-minder? 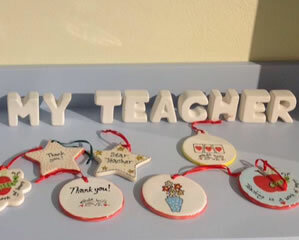 Your child can create something special for them or maybe a whole class can create something together - a plate with the fingerprint of each child in the class alongside their name, or a vase with a picture drawn by each child can make for a wonderful gift that 'sir' or 'miss' will treasure for years to come. Please contact us for suggestions.